Hand poured Candle and Soap from Three Little Birds, Wilmington, NC: If you received our first box in October, these delightful gifts will look familiar. The lovely ladies at Three Little Birds have been making soaps for years, and recently added candles and lotion bars to their line of products. I love their environmentally friendly packaging and that they're all natural and organic with no animal testing. Their soaps are cold pressed in small batches using high quality ingredients. The Lavender soap is a winner for soothing holiday stress and the Cranberry Fig candle has a fresh holiday scent that delights. The only question is, will you give these away or gift them to yourself? Handmade Sand Dollar Ornament from Re-Eco Design, Wilmington, NC: Re-eco is a family owned business with 95% of the inventory produced by a family of four artists. Many of their items are one of a kind, inspired by the earth and sea. Not only are they amazing artists, they are good people. They are wonderful environmental stewards, making every effort to use recycled eco-friendly materials in their art and inspiring others to reduce, reuse and recycle. This cute handmade Sand Dollar ornament will make a great addition to your tree or a cute adornment for a bottle of wine to take to your next holiday party. Love Blue. Think Green. 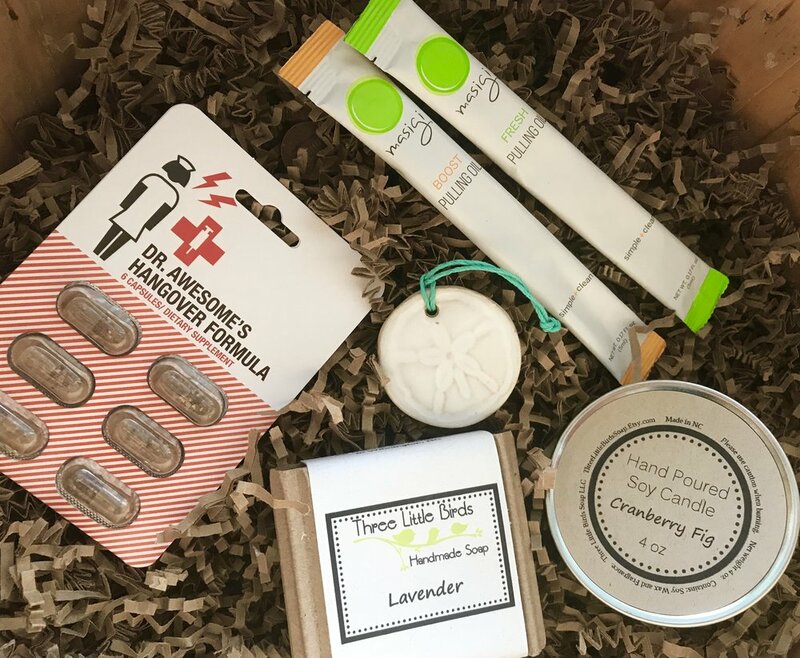 Dr. Awesome’s Hangover Formula, Carolina Beach, NC: Awesome Formulas is the creation of our local neighbor, friend and talented acupuncturist, Jeremy Linquist, LAc, MSTOM. Dr. Awesome’s Hangover Formula is a revolutionary blend of pharmaceutical grade herbs that assist the body with the breakdown of alcohols, reducing the negative side effects experienced when drinking. Whether it's one glass of wine with dinner or the rare overindulgence on New Year’s Eve, Dr. Awesome is there to help take the stress off your liver and encourage well-being from the inside out. Enjoy your holiday celebrations, even the next day! 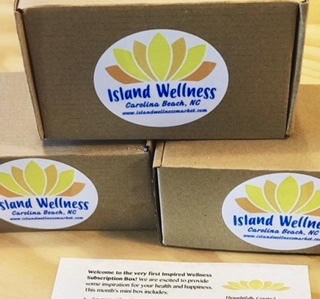 Oil Pulling Samples from Masigi, Wrightsville Beach, NC: Masigi is a small, woman-owned company focused on making products with clean ingredients that are easy to use. Oil pulling is a powerful Ayurvedic practice used for thousands of years to enhance oral health. These single-use oil pulling packets make it easy to try this ancient technique and incorporate oil pulling into your daily routine for a healthier lifestyle. MASIGI is a combination of two Filipino words: MAS meaning “more” and IGI meaning “goodness, wellness, harmony, excellence.” Masigi equals more goodness, more wellness, more harmony. Who couldn’t use a little more of that in their life? We hope the items in this month’s box inspire you to support independent artists, entrepreneurs and small, locally owned businesses this holiday season. If you missed out on this box, be sure to place your order for the January box by December 20th.